Your Google Analytics data is only truly helpful when it provides you with information you can use to improve your site. Which is tough…because Google Analytics isn’t always the easiest tool to navigate, right? But with the SEO dashboard in this post, you’ll be able to see all the most important information for your site from one convenient location. In this post, I’m first going to share the actual SEO dashboard that I use for my personal sites – you’ll be able to install it with a couple clicks. Then, I’ll explain what every metric in the dashboard means, as well as how you can use each metric to gain important insights about your site. You already have Google Analytics set up on your WordPress website. You know how to navigate the GA interface on a basic level. If any of these three things is untrue, click on the link and read those articles first. Without that foundation, this article may be a bit too complex for you. Kind of a lot to take in at first glance, so I’ll break it down for you later in the article. But first, let’s get it installed so you can follow along. Installing the dashboard is simple; just click here and you’ll be prompted to choose an analytics account and view to install it on. Once you click Create, Google Analytics will do everything else for you. 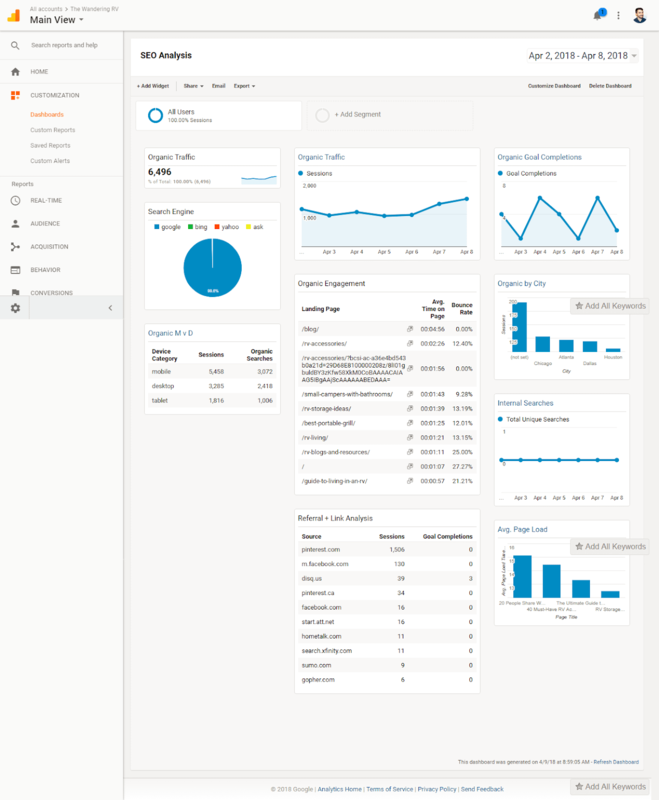 To find your new dashboard, just go to “Customization” -> “Dashboards” -> “SEO Report”. If you want your teammates or web developer or anyone who has access to your analytics account to be able to see it, you have to share it first. To do that, just click “Share”, then “Share Object”. Now anyone can see it. Now that it’s set up, let’s talk about how to use it! This is simply the number of visitors you’ve had to your site from organic search results over the given time period. Simple, right? Pro Tip: I like to use this to compare my traffic week over week (or month over month). To do that, just go to the date range box in the top right corner, select your date range, then check the box that says “Compare to previous period”. This lets you see how you’re doing over time. Hopefully, you’ll see an increase. But your searches could be seasonal (or even vary depending on day of the week), so keep that in mind. 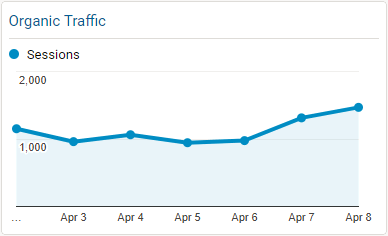 For example, my site gets way more visitors on the weekend than during the week. 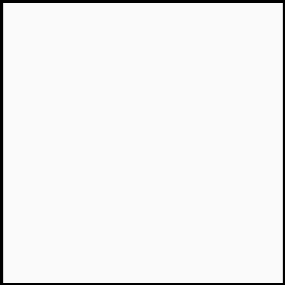 Unlike the numeric box, this chart will show you your progress over time. 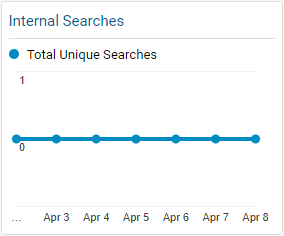 You can use this to see what days/weeks/months you tend to get the most traffic, and to see any trends (upward or downward) in your search traffic. Like the numeric value, you can use this to compare traffic to previous periods. 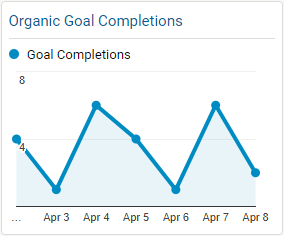 If you’ve set up goal tracking in your GA account, this box will show you the completions of that goal over time. For example, I use it to track email subscribers to my content upgrades in my articles that rank on search. But you could use it to track any action(s) that you want your visitors to take. 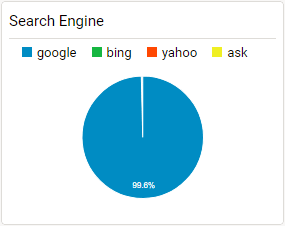 This box shows the breakdown of your traffic based on search engines. 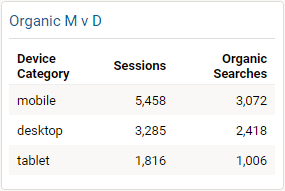 For this site, I haven’t done ANY work toward ranking on the other three engines (because Google gets the vast majority of traffic), so it’s almost entirely Google traffic. The organic engagement box shows you user engagement for the pages that are ranking in search. 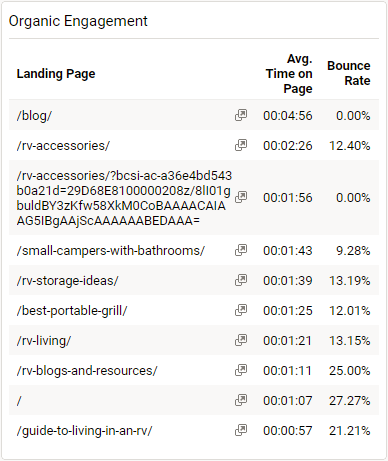 Specifically, it shows the average time on page and the bounce rate. In case you didn’t know, bounce rate is the percentage of people who leave your site without visiting a second page. Sometimes that might mean they hit the “back” button. Other times, it might mean they clicked an external link. Google Analytics calculates this metric a little oddly, so someone who spends 10 minutes reading your entire article can still count as a “bounce” if they don’t view a second page. But at a high level, it’s a good estimate of how engaging your content is. And because user engagement is a ranking signal for Google, it’s important to pay attention to. In case you’re a local business – or you want to target a specific city for some reason – this box will show you which cities are sending you the most traffic. 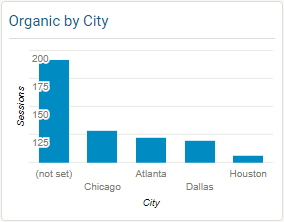 The majority will come up as “not set” because the IP address isn’t associated with a city or is hidden from GA, but it will still show your most popular cities. Hey, Chicago! Most of you probably won’t have internal searches unless you’re an eCommerce store or a major publisher of content. This blog only has about 12 posts, and they’re easy to navigate, so no one really searches internally. That said, internal searches are good to know because it will show you if you need to improve your internal link structure. A high amount of internal searches can be indicative of poor internal linking (meaning people are having a hard time finding what they’re looking for, so they need to do a search for it). As you can see, almost 70% of my traffic comes from mobile (including tablets). This is important to know because it can help you tailor your content and design. 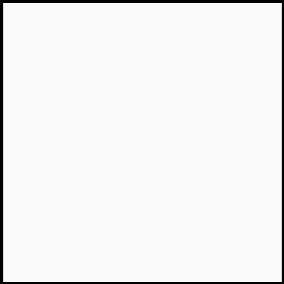 This box shows your referral traffic sources. In other words, it gives you a rough idea of the traffic coming from other sources besides Google, as well as how many goal completions that traffic brought. You can use this data to determine what other avenues to pursue besides SEO, especially based on which bring you the most leads/goal conversions. 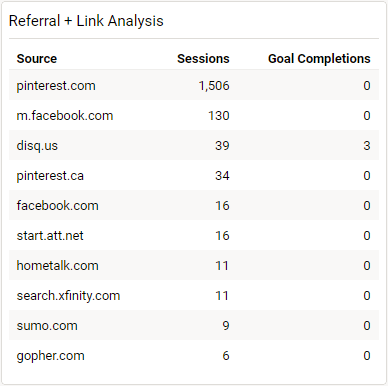 For example, in the screenshot above you can see that Pinterest also brings a good amount of traffic. That’s important to know because now you have another viable traffic source beyond Google. 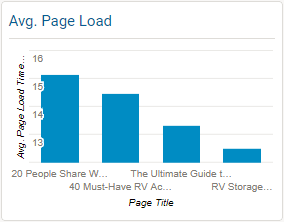 Page load speed isn’t a ranking factor, but a slow page load speed can hurt your rankings. It’s the stick, not the carrot; Google punishes slow sites but doesn’t necessarily reward fast ones. These days, it’s a given that your site needs to be fast. So if you see an overly high load speed on your pages, be sure to investigate! You may need to compress images, enable page caching, or get a faster hosting provider. And that’s all there is to it! 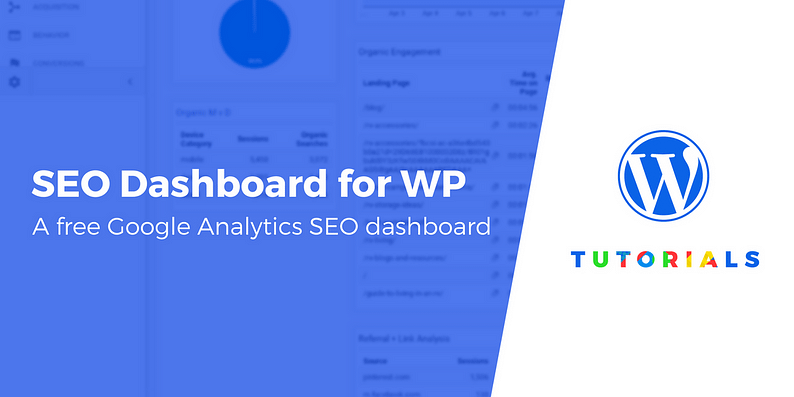 I hope you’ve enjoyed this breakdown of my WordPress GA SEO dashboard and find it useful in your quest for better rankings and more traffic. If you have any questions, feel free to leave a comment down below. And if you improve the dashboard, definitely let me know!